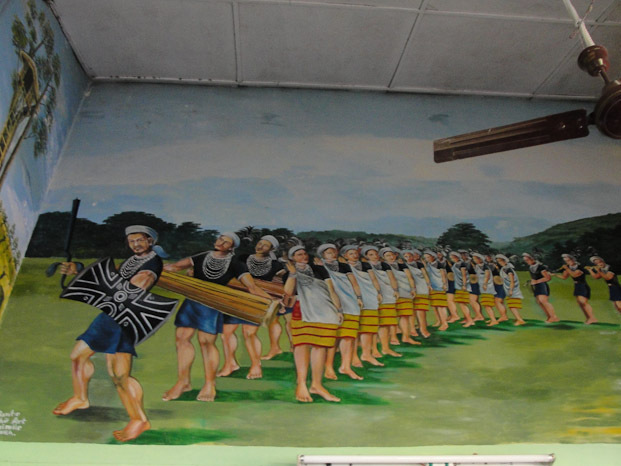 This is a mural painted by local artist depicting tribal dress and dancing. 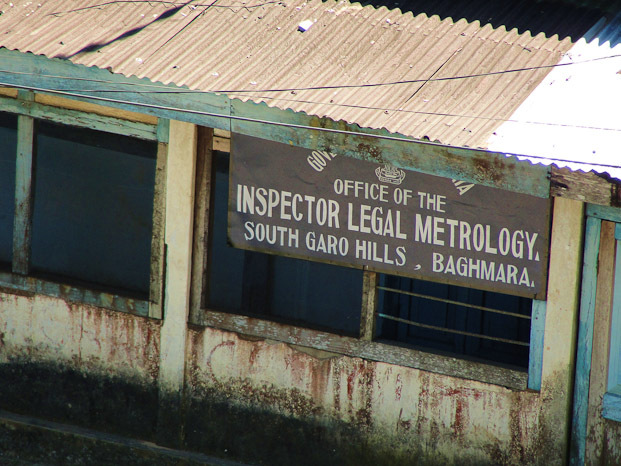 It is on the roof of a tourist lodge. 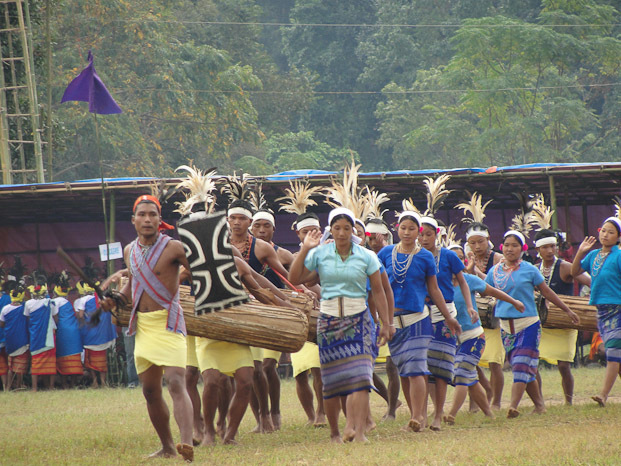 Every year the annual Wangala festival takes place in November, in none Christian settlements. 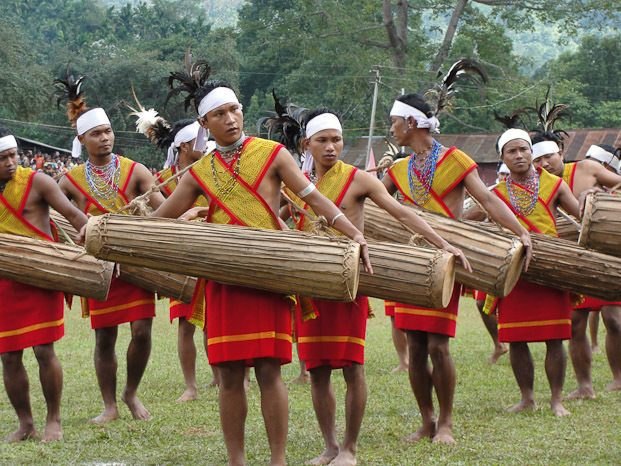 It is colourful and musical including the hundred drums feature. A poster advertises a similar festival. 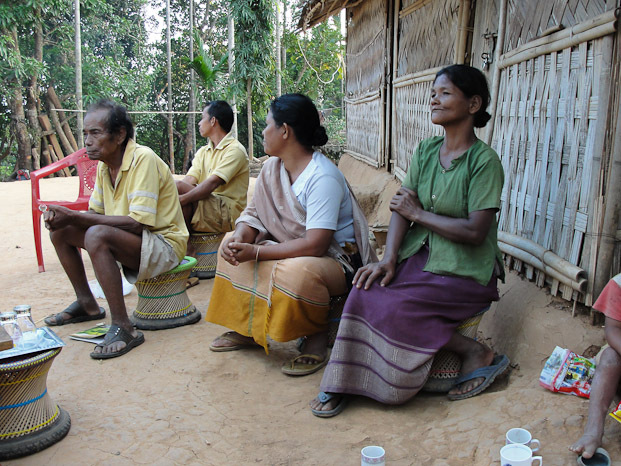 A Garo family watch from across a river. 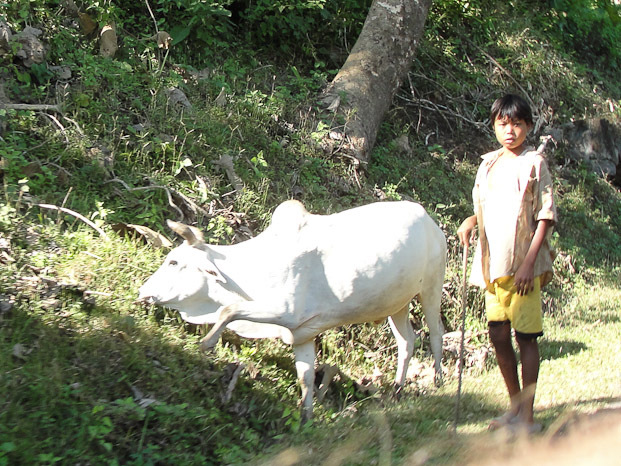 Westerners in these areas are as rare as hens teeth, and many young people have never seen white people. 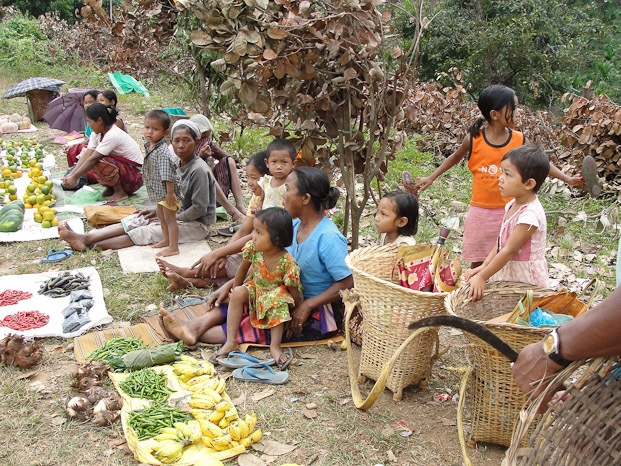 A typical family outside their hut. 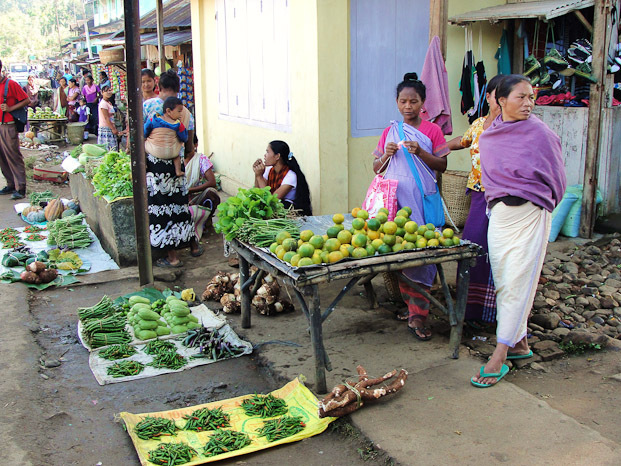 Every town, large village and even the open roads are lined with market produce. The local huts are beautifully made. 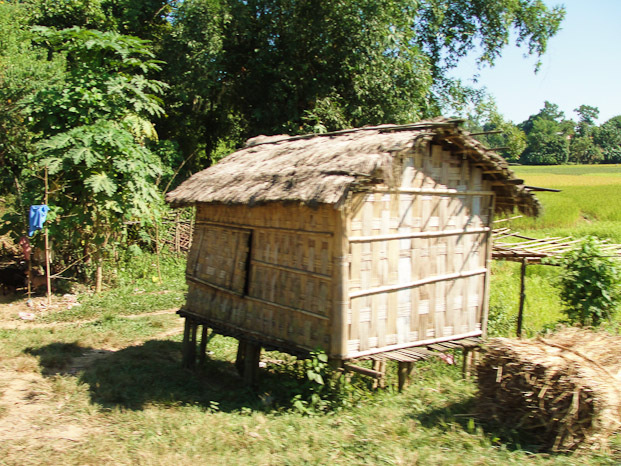 This is a rice paddy workers hut. 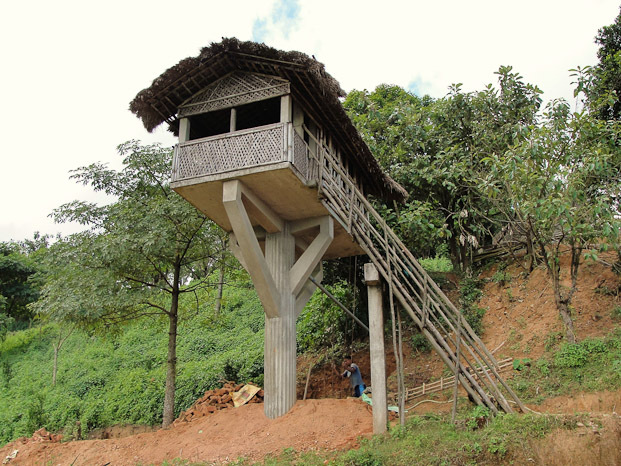 Most huts are on stilts to avoid any rising water in the monsoon season and to repel snakes. 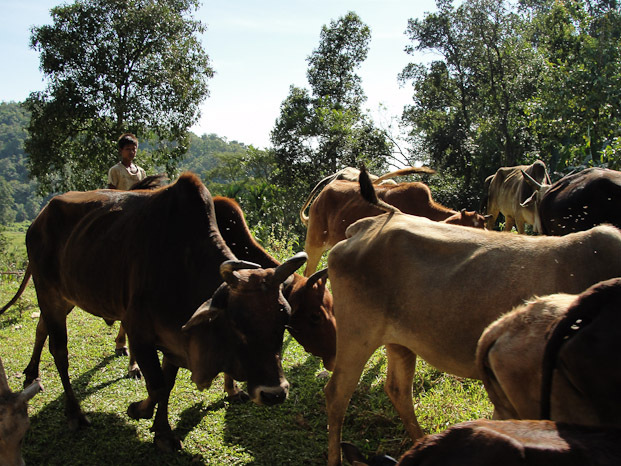 Most villages have there own cattle, some are tethered to roadside verges or like these, they are tended by herders, usually young boys or girls. 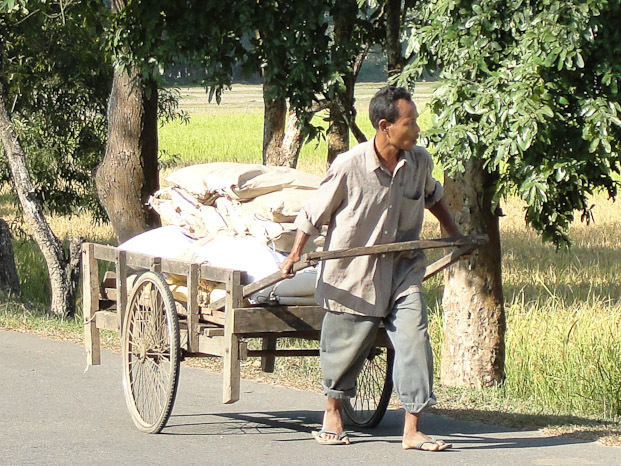 A man carts his goods from market. He had a breakdown in the form of a puncture, but fixed it hastily before moving on. Many men can be seen to be carrying items suspended from a bendy shoulder worn frame. 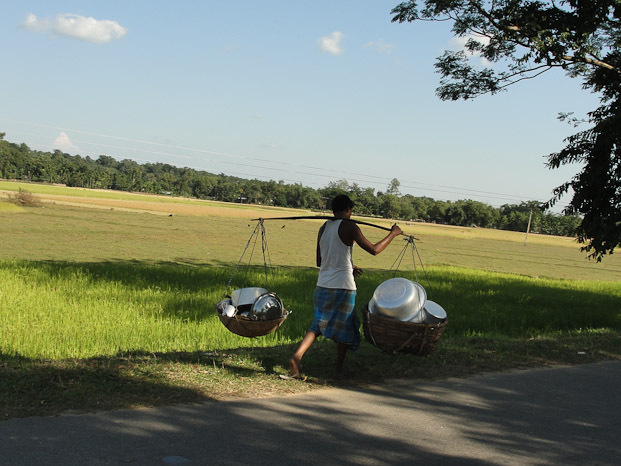 Many women spend all day gathering firewood and carry the heavy baskets many miles back to their villages. 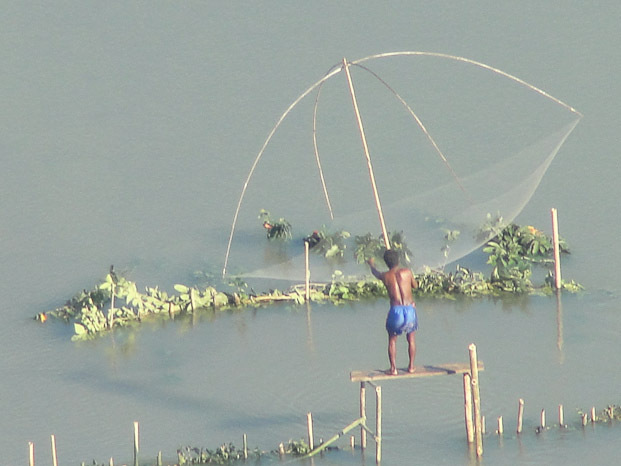 There are many rice paddies around the flat areas and border lands of Bangladesh. In the midday heat women men and children toil away. 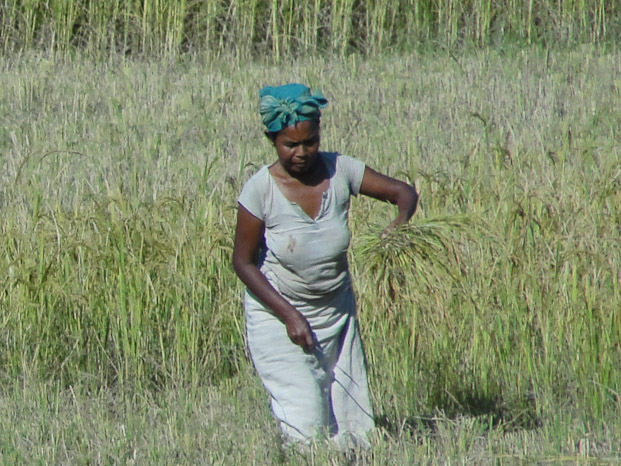 Here a lady cuts one of many sprigs of rice. 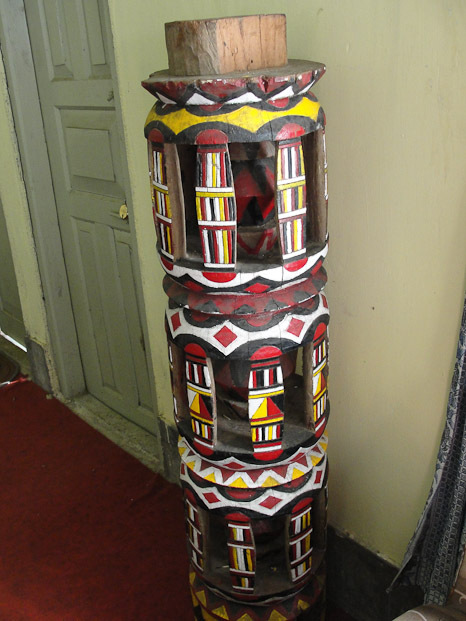 The Garo made tradition wooden carvings for their villages and homes. 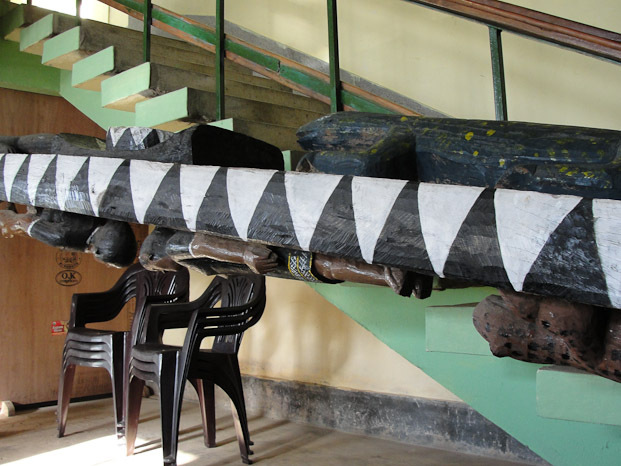 Some still survive in one of the tourist lodges. They may have shamanic meanings. 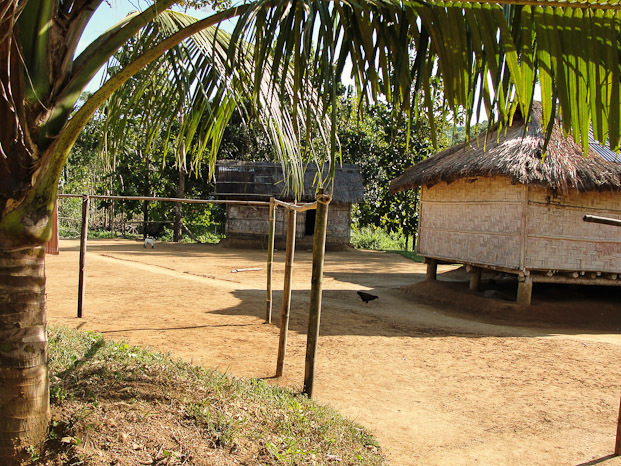 A Garo jungle hut. It is on stilts to allow wandering elephants underneath. 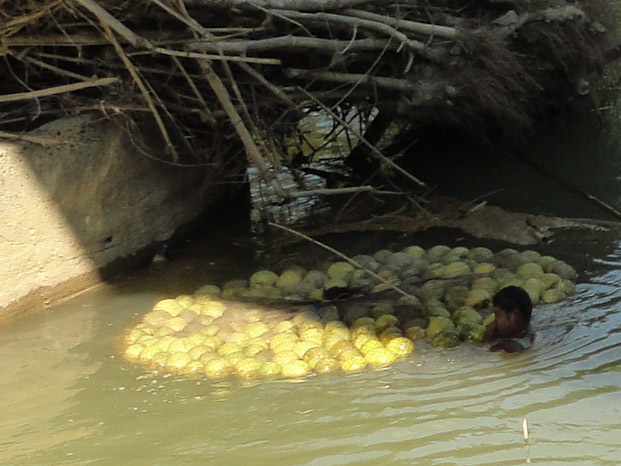 A man and his many melons keep cool in the river. 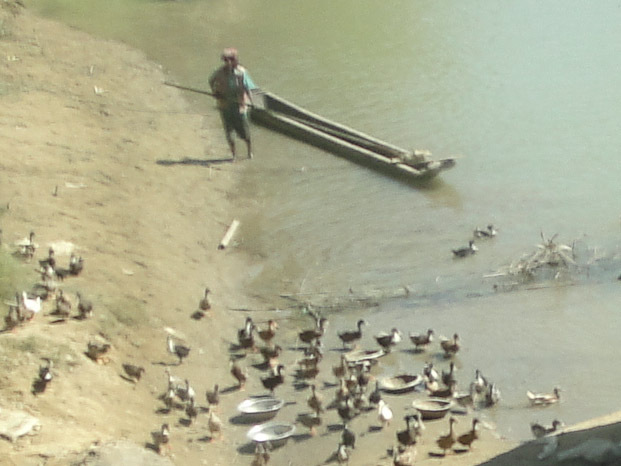 A duck herder watches over his flock. 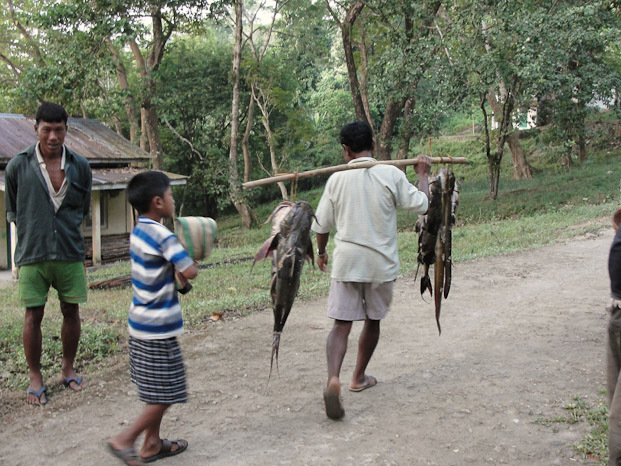 Eels and catfish caught by the villages before dawn near the village of Siju. Beetle nut is a mild drug used in a similar way to coca leaves in the tropical Americas. It is traditionally chewed and spat out. The bitter nut is chewed with leaves and makes one attain a sense of well being. Most people are habituated to it and their tongues turn red in time. 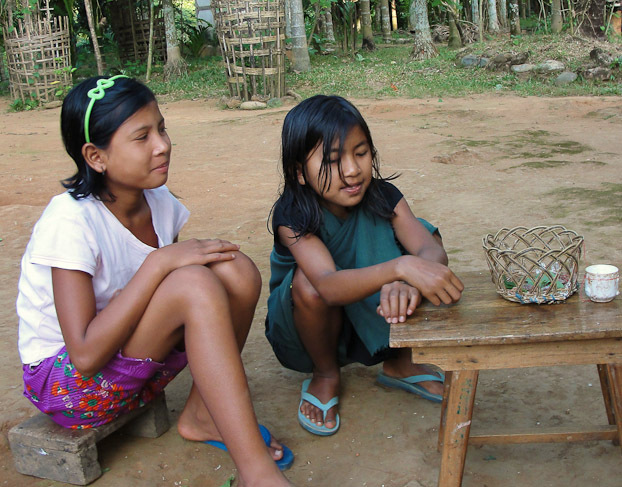 Here two young girls are trying to steel some left out for us after a snack and drink at a village. There are a few scientific establishments in some areas. 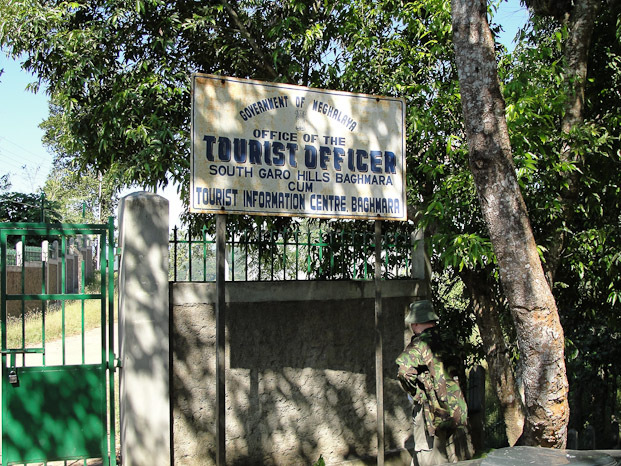 The office of the tourism officer. 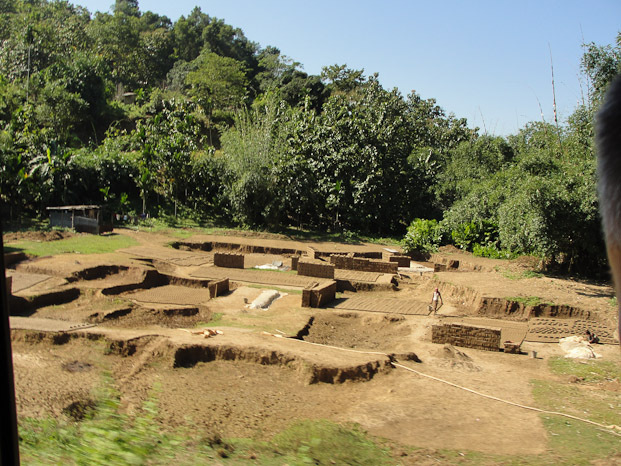 We did not see much house building but just one or two in the jungle areas. 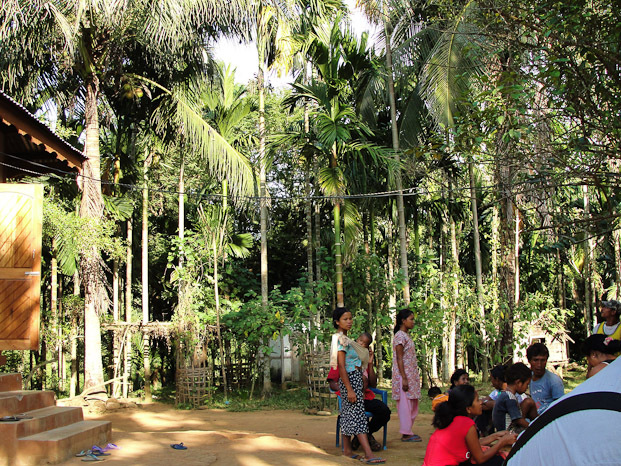 Maybe it will be one of the few posh houses like this one on the Bangladesh border. Behind was a reserve for the rare pitcher plant. Alcohol is basically not drunk in most areas, but in none Christian areas rice beer is for sale in the market streets. We bought two for our stay in a jungle hut. 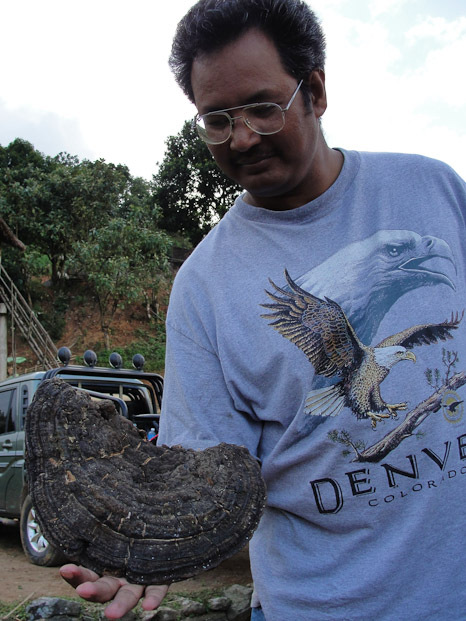 Dipu Marak, our tourist guide holds a bracket fungus up and pretends that he is an elephant. On the reverse side was a painted wartime scene. 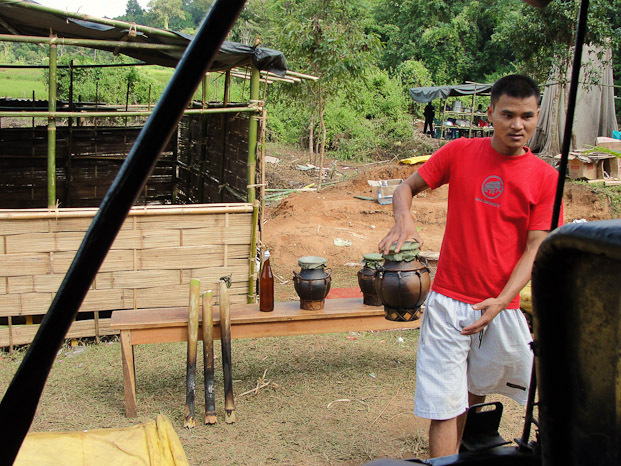 Our hired cooks at Siju Lodge. 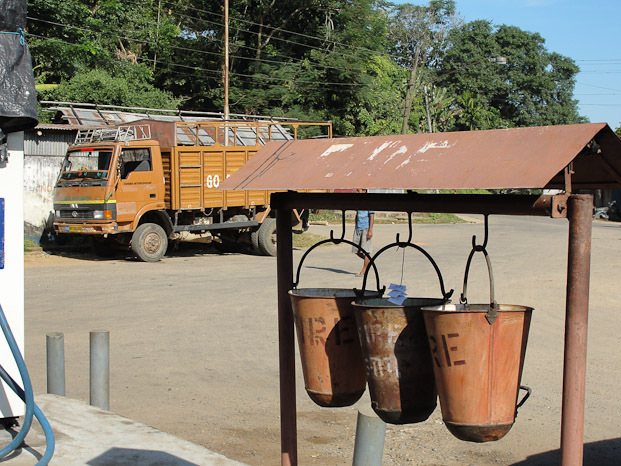 Most garages are run down and some still have old water buckets in case of fire. Many roads are in an appalling state, some are impassable while some have regular land slides covering them. Other split and has huge potholes. Most jungle roads would not take a normal car. We hired four wheel drives and still the journeys up to eight hours long a piece were back breaking. 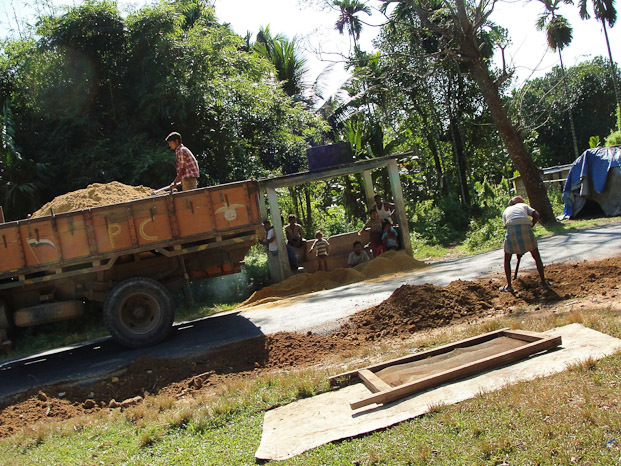 Here one road is being resurfaced.